In honor of National Blessings in a Backpack Week, KFC corporate employees and their partners at Henny Penny packed 1,500 Blessings in a Backpack bags on Tuesday to provide hunger-free weekends for children in need at local-area schools like J.B. Atkinson elementary. 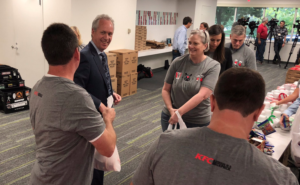 Louisville Mayor Greg Fischer joins KFC and Henny Penny to pack 1,500 bags of weekend food for local kids. KFC established a partnership with Blessings in a Backpack in early 2018 and has committed to fund the Blessings in a Backpack program for the 2018-2019 school year at J.B. Atkinson (JBA) Elementary School. Through their partnership, KFC will work with Blessings in a Backpack to provide hunger-free weekends for more than 400 students at JBA by sending them home from school each Friday with a grocery bag of weekend nutrition in their backpacks.